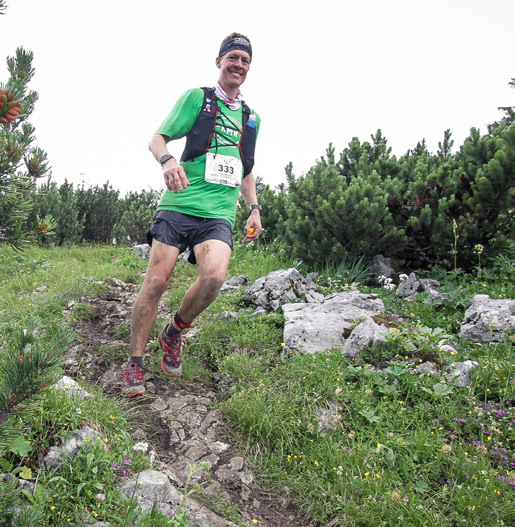 I love the Austrian Alps and found this race on Google. I knew the area well, having spent lots of time hiking near there. 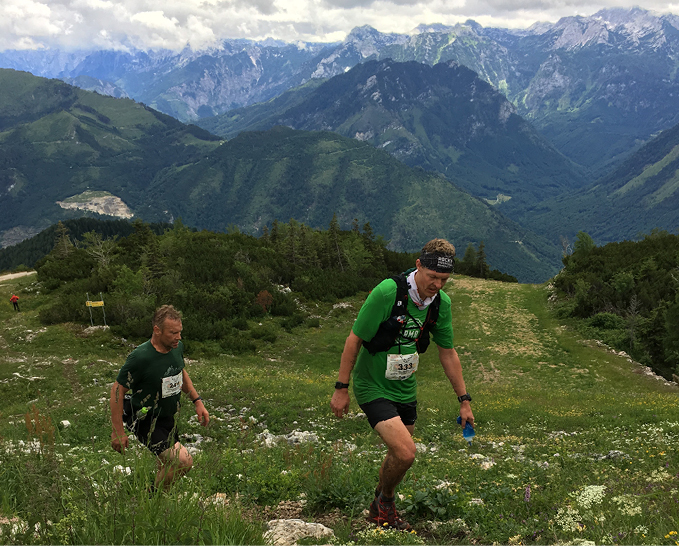 The area is beautiful and the race is well-established, relatively small, very local, quite inexpensive, and I get to climb a mountain I always wanted to climb, stuck into the middle of a 70 km race with at least 4500 m of gain! I love Austria. 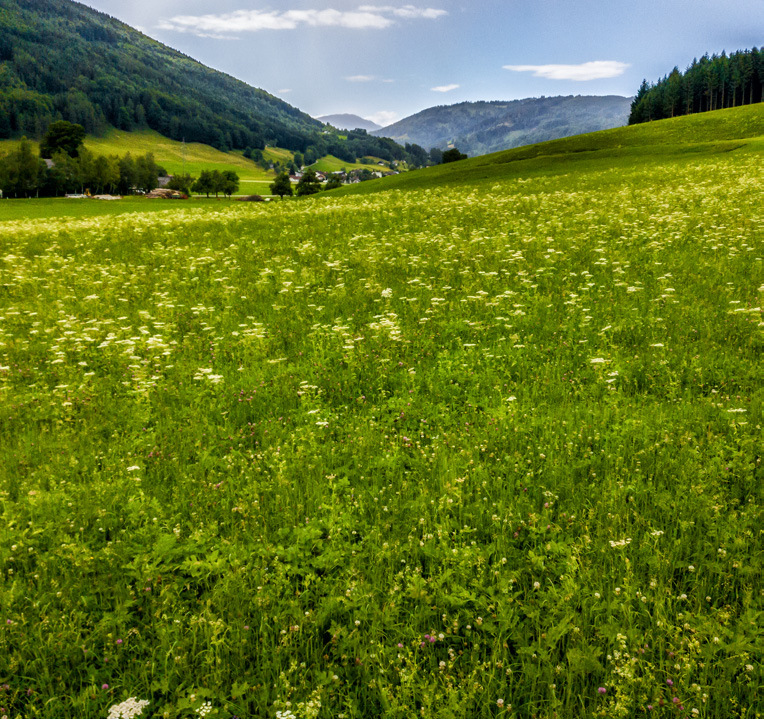 I fell in love with the country when I lived in Vienna at the start of my time in graduate school. I ended up there because I had spent my whole life in Colorado, which is not a problem, but it is said that one should see the world. But I didn’t want it to be TOO different; I loved the mountains and wanted to stay near them. So where to go? In CU’s undergraduate chemistry building, I saw a poster for an internationally diverse graduate program in Vienna. I submitted an application, got flown out for an interview (free trip! ), was accepted, and moved out. Fifteen months later I was back. The lab and the institute were not good fits for me and I wasn’t at all happy with my choice of career. I did, however, love the city and the country. I took nearly every weekend to explore my new home. 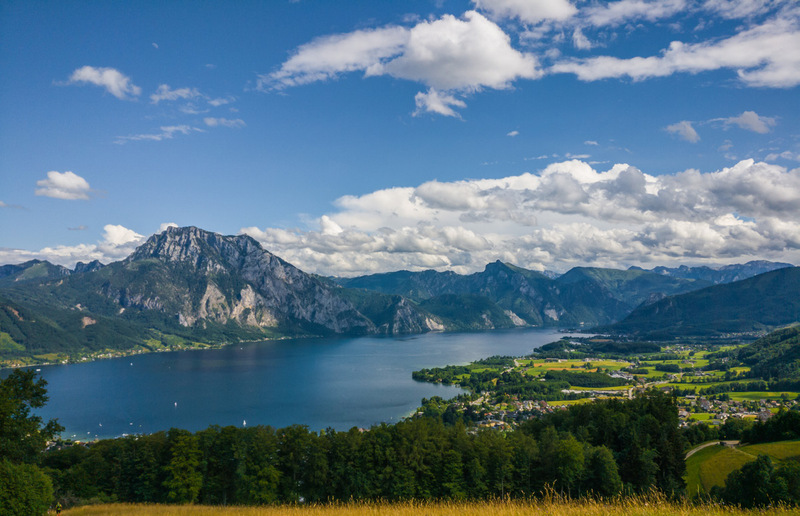 One region I kept returning to was the Salzkammergut, a history-rich region in central Austria that is a classic and dramatic landscape of glacially-carved lakes and mountains, with steep valley walls, craggy summits, and elongated and deeply-cut lakes. I always accessed the region the same way: a westward train from Vienna, change at Attnang-Puchheim, and go south through Gmunden, which served, for me anyways, as the gateway to the Salzkammergut. The train then went along the gentler western shore of the Traunsee (Lake Traun). 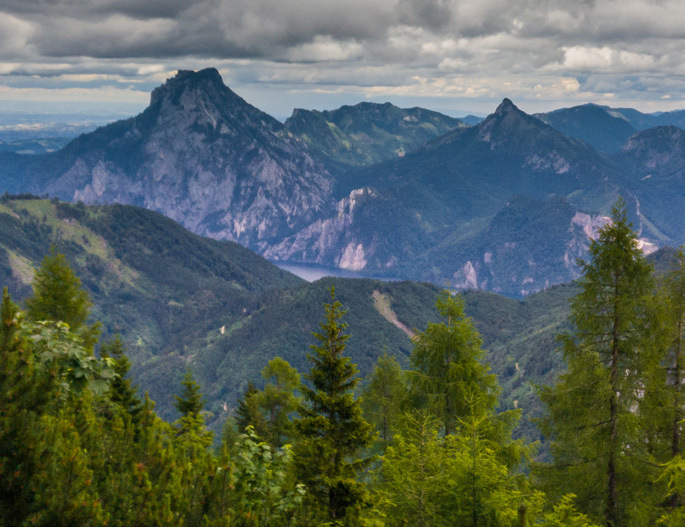 The more rugged eastern shore was mountainous but the view was COMPLETELY dominated by a single mountain: Traunstein. It rises almost 3500 feet above the lake and the lower, western summit is maximally 0.9 miles from the edge of the water. So it’s steep. And rocky. 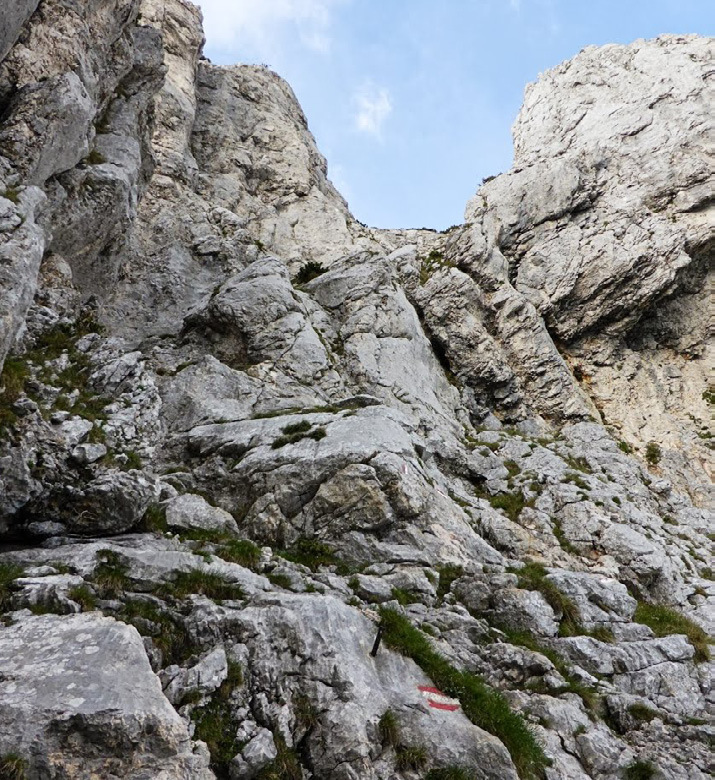 Ascent routes from the lake are all klettersteig, german for via feratta. Without any experience in that, I didn’t want to go alone, but none of my Viennese friends would go with me. It was too hard, they all said, and I left the country without ever doing more than looking at this beautiful mountain from the train window. Traunstein rules over the eastern shore of the Traunsee. 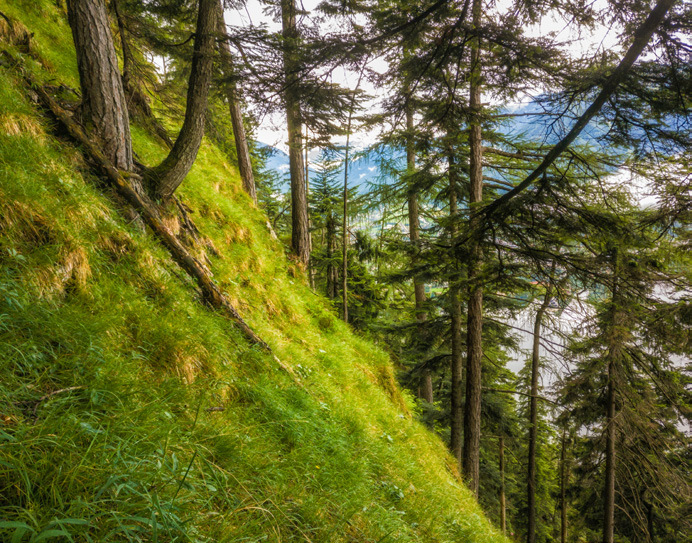 The Naturfreundsteig climb begins at the lower right, near the lake shore, and goes over the rocks to the small hut at the top. I was so excited to do this climb! Twelve years later, Ryan Smith ran UTMB. 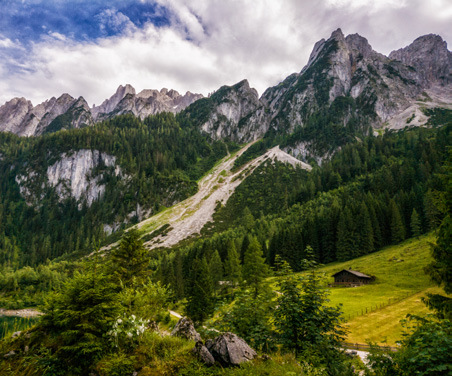 The photos of the area were stunning and I decided that I wanted to visit the Alps again. I hadn’t been back in those mountains since I left Austria in 2003. And I wanted to run a race there, but I definitely did not want to participate in the circus of the UTMB series. I had no desire to obsess about accumulating “points” nor did I want anything that was that commercialized or crowded. It’s beautiful, but… no. I looked elsewhere and the Salzkammergut of Austria was my first choice. 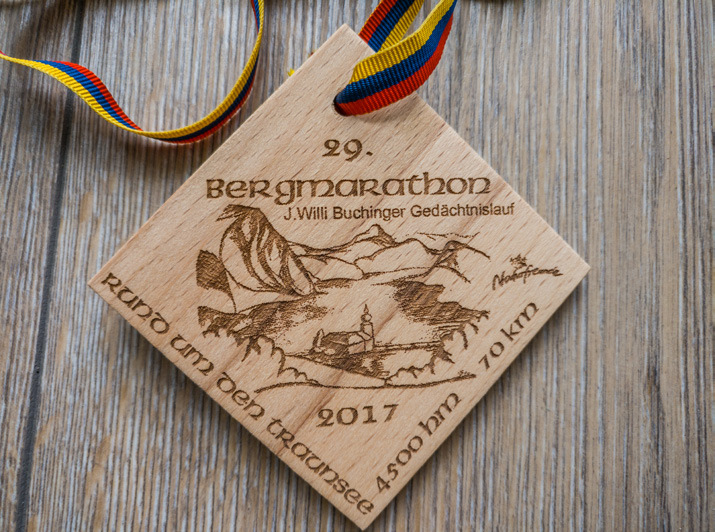 There were some options, but the Bergmarathon Rund um den Traunsee stood out. The race itself has been around for nearly 30 years. 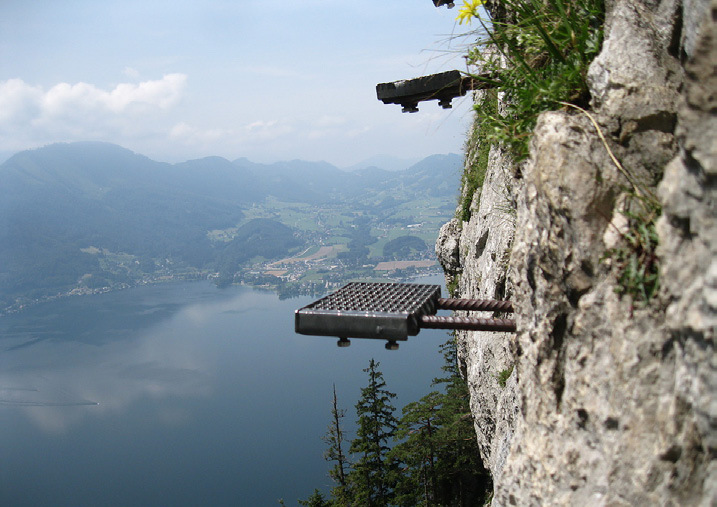 It was conceived in 1989 as a competition to climb seven mountains around the Traunsee. 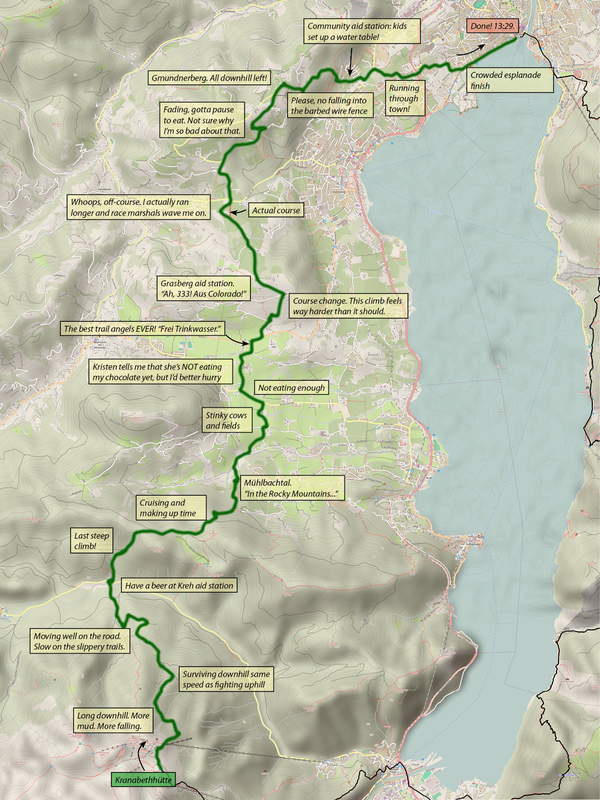 In its current course, it’s a 70 km circuit, hitting “nearly 7 summits” (not quite the summit of all of them), with a stated gain of 4500 m. The participation was about what I was used to (~350 for the full loop) and seemed to primarily consist of Austrian runners from many of the local running clubs, so I guessed it had a localized-type feel to the event. Combined with a registration fee of only 55 EUR and no point requirement for entrance, it fit exactly what I was looking for. AND, the course climbs Traunstein!! Too hard as a single hike? Let’s start it in the dark at mile 8 of a 44 mile race! We also put the race at the end of a nearly two-week vacation through the Alps of Germany, Italy, and Austria. We saw good RMR friends (Alberto and Chiara, with Sofia); climbed a mountain (Großer Donnerkogel); lost all the photocopies of our important documents (left in a hotel room in Gosausee); had lots of great cheese, meats, coffee, and chocolate; and only THEN did we arrive in Gmunden for the 29th Bergmarathon Rund um den Traunsee. So great to get to see Alberto, Chiara, and Sofia! Bright blue glacial water flowing past the town of Heiligenblut. 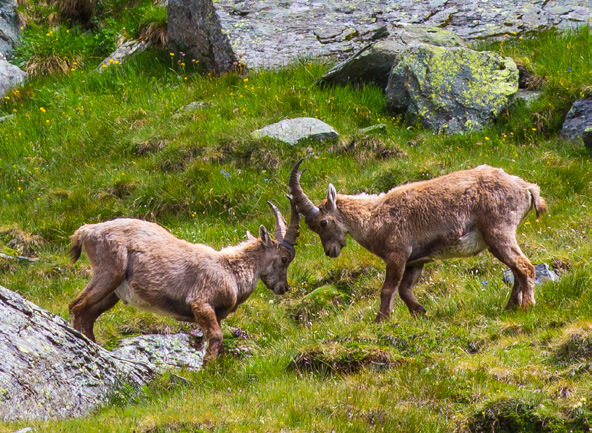 Young ibexes learning their craft above the Franz-Josef Höhe in Austria. Damn, this was a fun drive! The Großglockner High Alpine Road, in all its switchbacking glory. The view from our window at the Gasthof Gosausee. 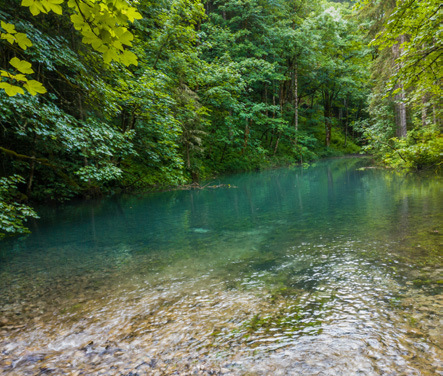 A beautiful blue pool of glacial melt near Gosausee. Part of my tapering: climbing the Großer Donnerkogel above the Vorderer Gosausee a couple of days before the race. 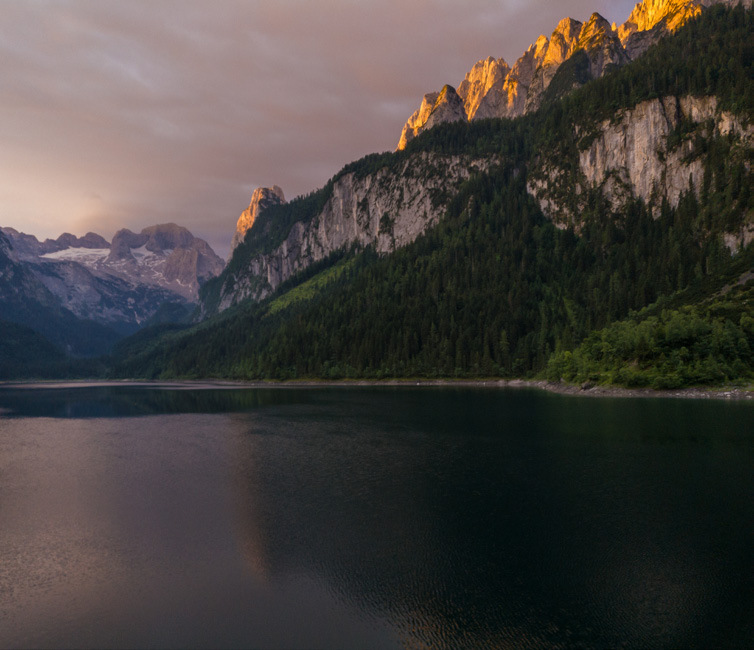 The beautiful Vorderer Gosausee. We spent 3 happy days on the shore of this amazing lake! 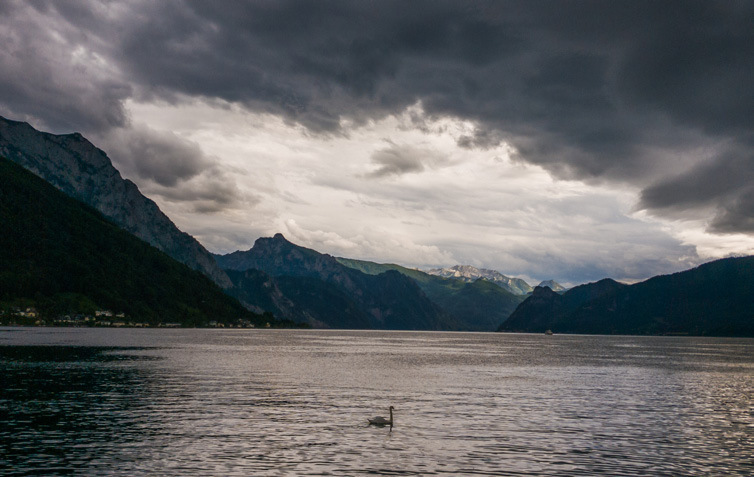 In Gmunden, looking out over the Traunsee and an incoming storm the evening before the race. It turns out that just in signing up for the race, I had made myself a minor curiosity. I already knew that Americans had very little prior representation in this race. In fact, I suspect that I am perhaps the first one. 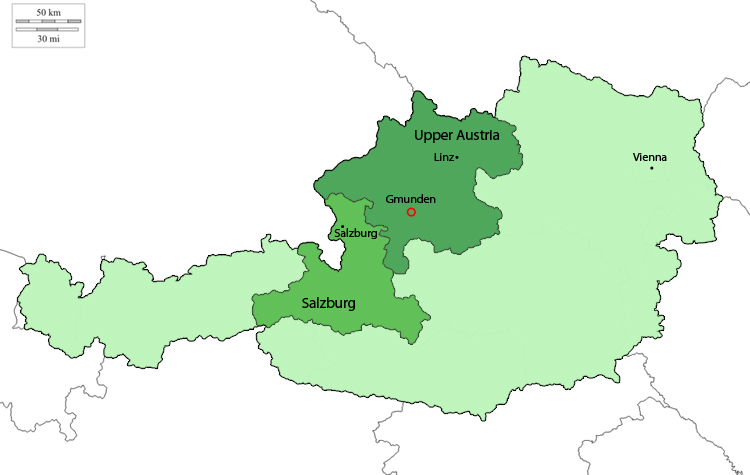 Shortly before we left for Europe, I received an email from a reporter with the Oberösterreich Nachrichten, a newspaper for the state of Upper Austria. 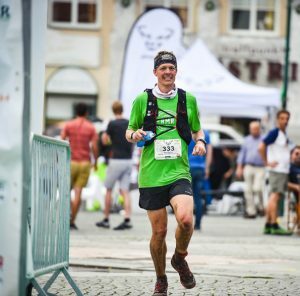 I answered some questions about how I found the race, what my interests are, and what else I’m doing in Europe, sent a photo of me suffering at the Dirty 30, and a couple of days before the race, a story appeared in the newspaper! It’s go time! Bib number 333. “This mountain is SO COOL!” Those were my thoughts, despite the steady rain, as I pulled on the steel cables with one hand and found handholds on the smooth, slippery limestone with the other. 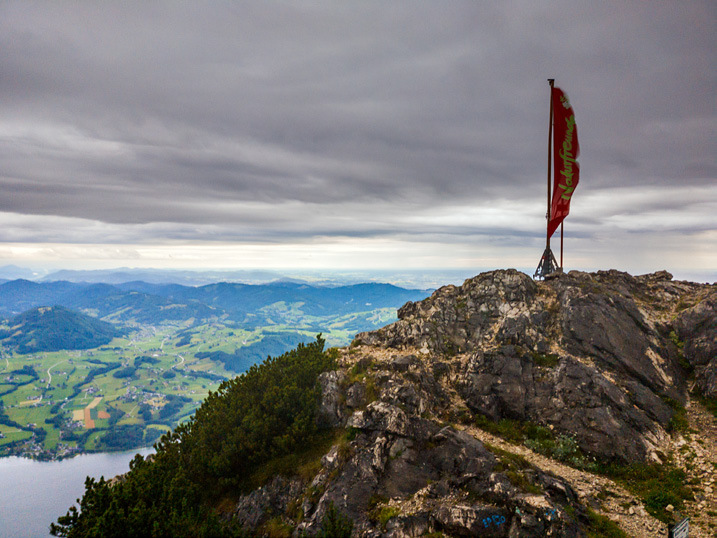 We were nearing the top of our Traunstein climb, the Naturfreundsteig, which took us from the lake shore up 3650 vertical feet in 2.2 miles, often aided by steel fixed cables, rebar steps and handholds, metal platforms crossing vertical rock faces, and one 26 foot ladder. Memorial markers for on-mountain deaths materialized out of the rain and fog. This is a serious mountain. And it was beautiful and exhilarating! Despite the rain, fog, and risk of sliding off the mountain, I was having a good day. It didn’t start that way. Around 3:15 AM, 5 minutes into the trail on the first climb, my headlamp sputtered its last, having burned its battery out in the suitcase. Soon after, while taking off my now useless headlamp, I found out that my sunglasses had escaped my head. But things started looking up; the hulking shadow of Traunstein had loomed ahead on the fast run down from Grünberg. And now here I was, FINALLY CLIMBING TRAUNSTEIN!! At the summit, the rain relented enough to snap a few pictures. I hadn’t gotten any on the way up because my hands were pretty busy and wet, so I’ve included some from others on the internet. There’s no introduction to this climb, just business straight from the beginning. Photo by ÖAV Sektion Gmunden and accessed on bergfex.at. 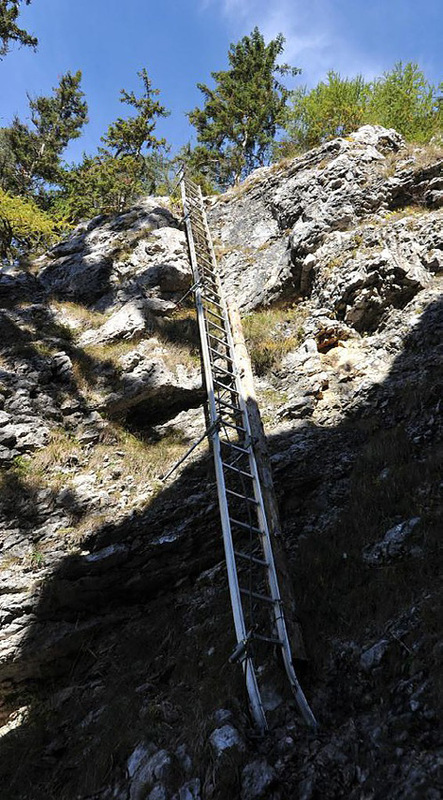 A 28-foot ladder on the Naturfreundsteig climb. Photo by ÖAV Sektion Gmunden and accessed on bergfex.at. The “Klammerstufen” section was a little bit scary in the rain. We came up from the lower left, along the wall with the cable, then up the steps. Photo by ÖAV Sektion Gmunden and accessed on bergfex.at. A closer view of the “Klammerstufen” and the exposure that comes with them. Photo by Gert Gasperin and accessed on bergfex.at. The upper part of the Naturfreundsteig, just past Böses Eck (Wicked Corner). Photo by Normann Steidl and accessed on panoramio.com. One of the few photos from the summit that I was able to take while soaking wet and fighting against the cold wind. Standing on the summit, looking towards Ebensee and much of the rest of the course. 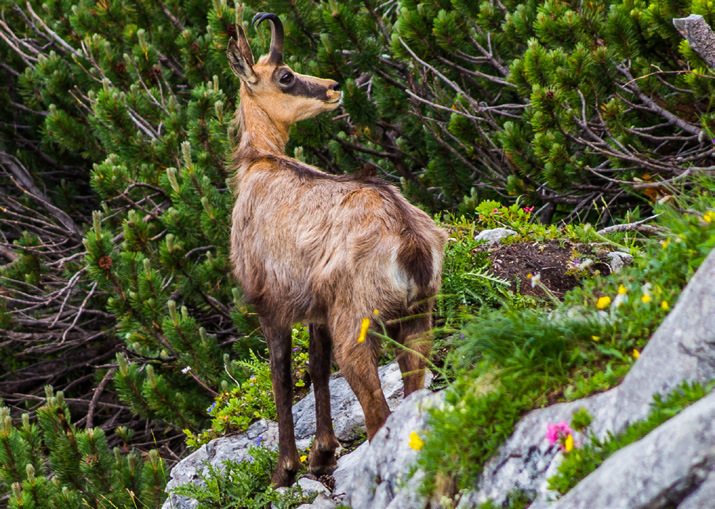 The spooked chamois (Gämse) had ripped through the line of runners and bounced onto a scree slope. It turned downhill and descended like lightning, crossing through the pack of runners a couple more times before it disappeared. Calls of “vorsicht!” (look out!) followed it down the mountain. A chamois. Not the offending one, but a momentarily docile one on Großer Donnerkogel. 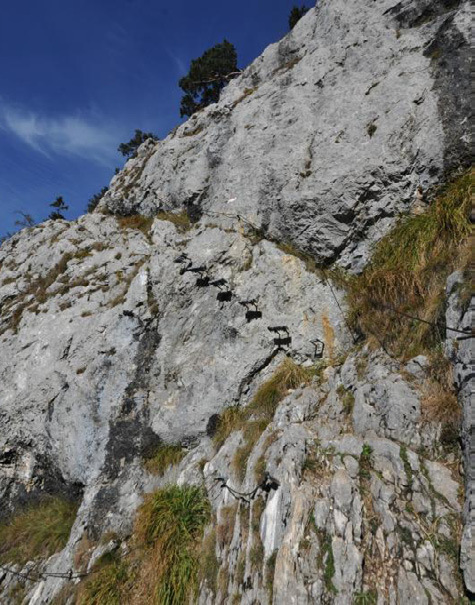 Meanwhile, we humans were slowly picking our way down the Mairalmsteig descent from Traunstein. It was muddy, rocky, slippery, slow, and viciously steep: 2715 feet lost in 1.3 miles. Not long after, I got a much more serious wake-up call regarding how intense this descent was. Without our switchbacking, the descent distance for 2715 feet is about 0.9 miles, so the physical slope of the hillside averaged -57% with local pockets of around -80%. When my foot slipped off a rock and off the trail, I fell and began to slide. I managed to grab a rock to arrest what would have been a very bad end to my day. As I climbed back up, accompanying a lot of sounds of concern from the people around me was the phrase “richtig Lebensgefährlich,” which translates as “truly mortally dangerous.” Indeed. I was SLOW on that descent from then on. Even still, I lost count of how many times I fell, some drawing blood. Poles would have helped. I brought them, but figured that I would need both hands on the Naturfreundsteig more than I would need them on this descent and I hadn’t worked out how to attach them to my Salomon pack. I think I might have been wrong. Never in my life have I ever been so happy to see an aid station as I was to see Kaisertisch at the bottom of the trail. This text message I sent to Kristen just about says what I was feeling. Yeah. Says it all about descending the Mairalmsteig. My legs felt fantastic, I was staying well hydrated and fueled (for once! ), the rain had stopped, I was drying out, and the scenery was great. A lot of people were out hiking and sending smiles and EVERYONE said a word that I still can’t identify. Sounds a bit like “günstig,” but surely doesn’t mean “affordable” or “fortunate.” Still a mystery. 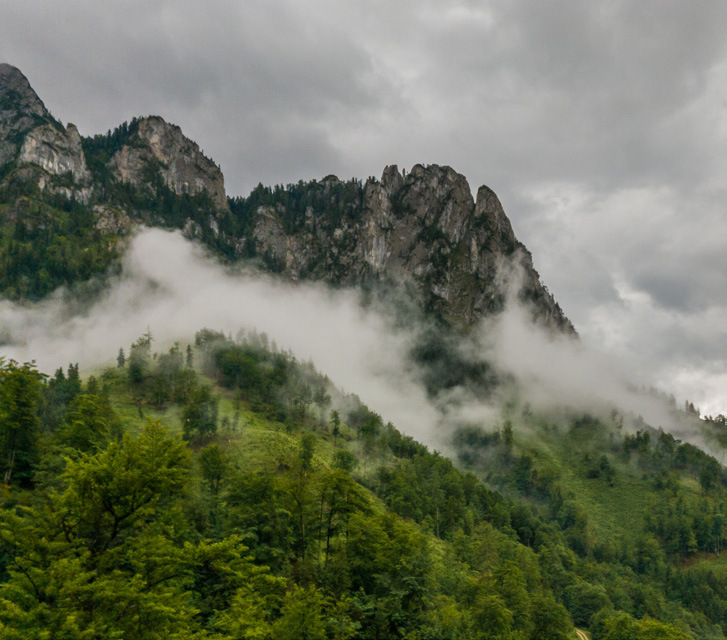 Clouds clinging to the mountains between Kaisertisch and Karbach. The trail alternated between good dirt road and “trailish” mud slides through the forest. Everyone was caked. I came through Karbach feeling happy and fresh, but “The Cursed Daxnersteig,” as I’ve seen it called, lay ahead. It seems universally acknowledged as the hardest, most demoralizing climb on the course. Up to this point, the climb to North Diamond in the Never Summer 100K had been the steepest climb of my running life. That climb nearly straight uphill fits 1300 feet into 0.75 miles. The Daxnersteig, with switchbacks, jams 2200 feet into 1 mile. See the photo below of the grade on the final third of a mile (the worst bit): on average, the hillside clung on at a 75% grade and our climbing grade averaged about 50%. It was pretty unreal. The lake kept getting farther away and I would think “surely it’ll be done soon,” but it never seemed to be. In the end, that 1 mile took 54 minutes of external and internal struggle. The Daxnersteig. Zounds, that’s steep! 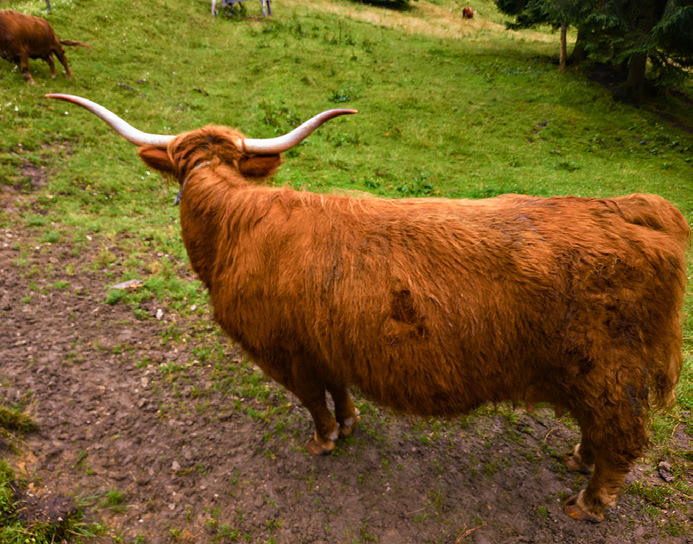 Like a troll guarding a bridge, a furry cow with some intense-looking horns moved into position to block the gate from Spitzlsteinalm and the trail down to Ebensee. What do we do, wait it out? Nope. I saw another racer familiar with these situations walk up to her and push her horn to turn her head. She obediently stepped to the side. A little. Then through the gate, he went! I followed, stepping off the trail enough to lessen the possibility of impalement if she turned her head back. A happy Austrian alpine cow, finished with her gate-guarding duties for the day. Down to Ebensee! I met Kristen, who successfully bought a ticket and navigated there without much knowledge of german, ate some fruit, but didn’t partake of any of the gourmet sandwiches that look exacty as one would expect in semi-rural Austria. I changed out of my thoroughly disgusting Inov8 shoes and into some Mammuts, which gave a bit more padding for the road sections ahead. 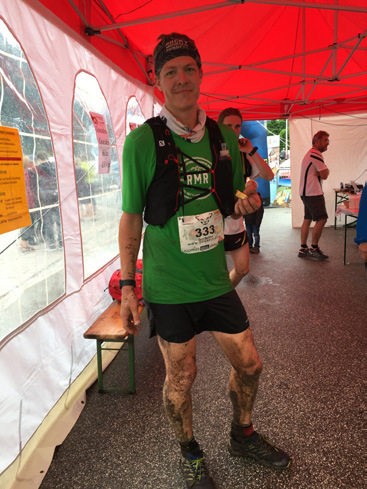 In Ebensee, a lot muddied, a little bloodied, but feeling good! Photo by Kristen Barthel. I immediately got lost, like within view of the aid station kind of immediately. I don’t really know how it happened. I blame it on the fact that Ebensee felt like a metropolis and I couldn’t find the flags. A passing motorist set me right, directing me down a quiet side street to the bottom of the nearly 400 stairs that led up the Kalvarienbergweg, a path which seems to be part of an old pilgrimmage route from the late 1600s, then onto the singletrack climb up to Feuerkogel. I felt really hot in this forest. The sun was out and all the water in the ground was heading into the air. I felt like I was struggling here. I realize now that I had stopped drinking well, too. Whoops. And then up ahead was a half-naked guy. I saw him stop, take his shorts and underwear off, chill for a bit (“airing out,” maybe? ), then start redressing as I went by. That’s a strategy… I guess. He caught me some distance on, when I stopped to have a Snickers bar. He patted me on the shoulder as he passed, said “250 vertical meters left,” in German. We started walking together and he said in English: “So, Colorado?” We chatted a bit about Colorado and Austria; it was nice to have a bit of company until he pulled ahead on another steep section. 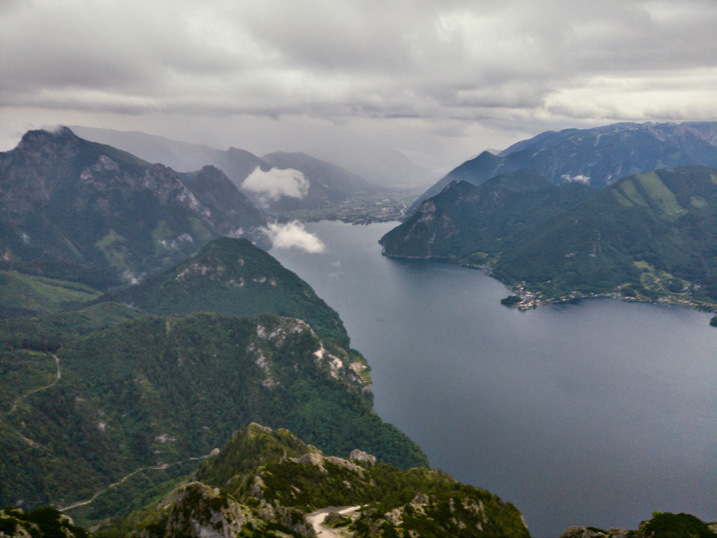 Looking down to Ebensee from Feuerkogel. Photo by Kristen Barthel. Nearing the top of the long, tough climb to Feuerkogel. Photo by Kristen Barthel. Finally, there was Kranabethhütte and the aid station. Kristen had taken the cable car up from Ebensee and was waiting in her bright yellow Houdini on the patio. Apparently, crewing isn’t really a big thing here; she garnered a lot of attention and appreciation for her bag of goodies for me, with lots of impressed chattering in both German and English. But she wasn’t the only crew! Another guy came up behind me and his girlfriend/partner had some hot tea waiting for him. Pete Newton, is that you? The final 15 miles of the course were a mix of singletrack trail, with the standard mud and slippery limestone, good forest roads, and asphalt roads through small rural communities. But those communities really made this section shine. Some of my best memories from the race came from this segment. It didn’t hurt that the weather was also much better! 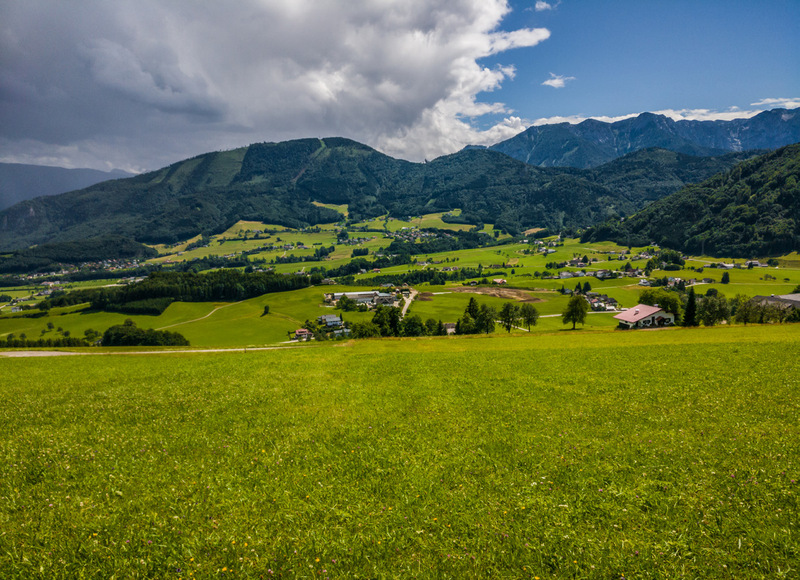 Traunstein stands out from all angles. This is looking over to the eastern shore from the descent down Feuerkogel. Trying to stay on my feet descending Feuerkogel. Photo by sportograf.com. From Feuerkogel through Kreh to Mühlbachtal, it was pretty quiet running. Everyone was spread out and I only saw a few people. 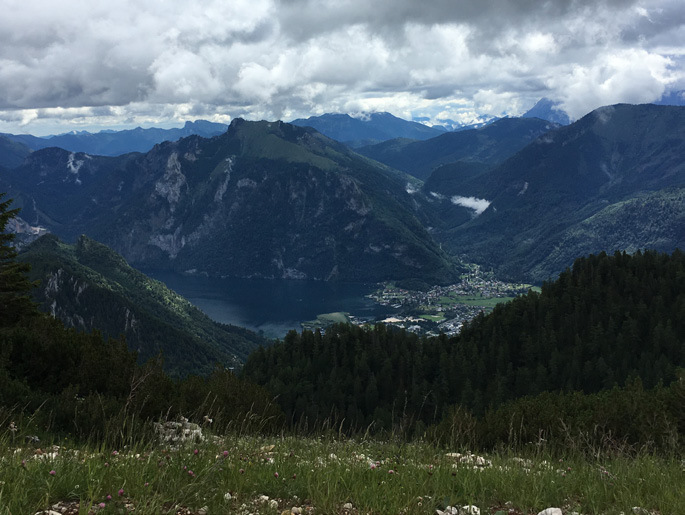 I had nice views across the mountains and the lake to Traunstein which, when combined with the wildflowers on the trail, made me take my eyes off the rocks for just long enough to slip and slide. Climbing out of Kreh was the final steep climb and then smooth cruising into the Mühlbachtal station. At Mühlbachtal, I was greeted with an excited “Ahh! I know you! 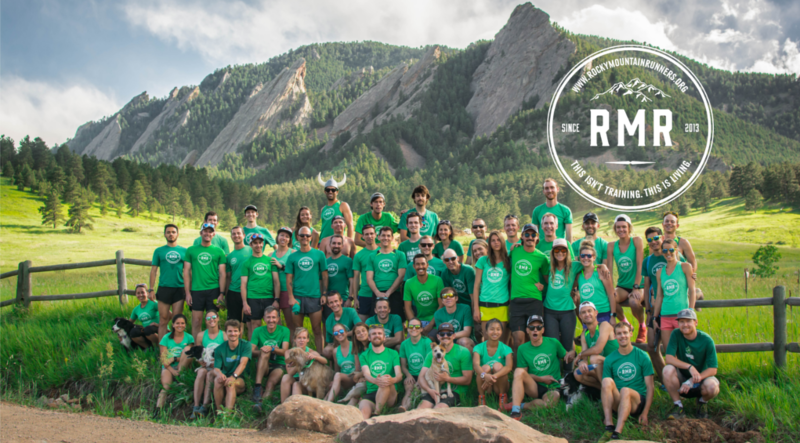 You’re from Colorado!” from another runner who had read the article. The aid station seemed to be set up inside a private family’s garage. The volunteers here were, as always, wonderful, but I remember one in particular. There was a girl helping out who was probably between 10 and 12 who wanted to hear all about the Rocky Mountains… in English. Her English was amazing for someone so young and she proudly told me that she took it as a class in school. I had fun chatting with her about Colorado and our mountains. If I have to run on roads for the final bit of a race, it’s okay when it looks like this! The perfectly pastoral Mühlbach valley from the climb up to Grasberg. For some reason, I just don’t eat enough in these races. I did pretty well for the first half, but it all kind of fell apart in the second half. Maybe it’s because when I’m running well, I don’t want to stop. I’m not proactive about it and tend to be more reactionary. It caught up to me near the final aid station. We had recently left the road and entered a very dark forest, the kind the Grimm Brothers would have written as a significant plot element into one of their tales. It was the last climb, up to the final aid station at Gmundnerberg, and I had to stop to eat (I’m especially bad at eating on the move). Damn! At least it was dark, mossy, and cool. At Gmundnerberg, I stopped to eat some more and get some water for the final 3.5 mile section. I was going to finish strong. 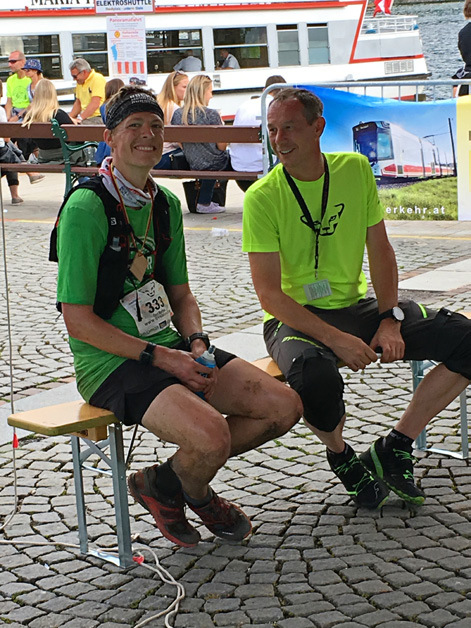 The aid station was outside of a bustling gasthof and the beer drinkers on the patio would loudly cheer every time someone came by. Done with the climbing and ready for the final stretch through town! Taken from Gmundnerberg, looking out over the Traunsee, dotted with boats, to Traunstein, now in the sun. I had been falling all day, so as the course passed right next to a nasty-looking barbed wire fence, I took it very easy. That would have been the worst fall of the day. Through town, there were two more community aid stations. The first was set up by some neighborhood kids, who were handing out plastic cups of water and made sure that we all knew that just down the road was a trash can. No littering! 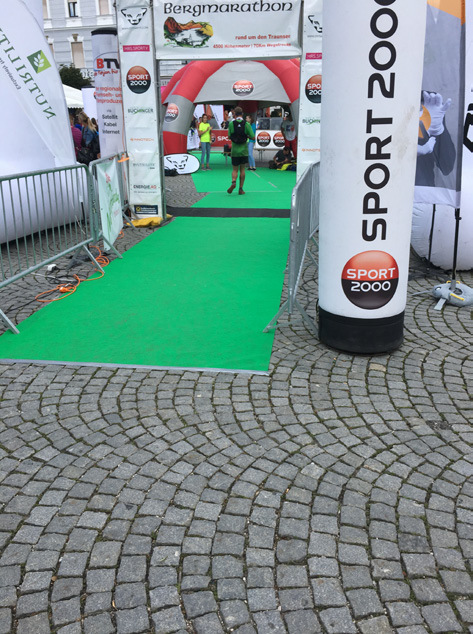 The second, an unmanned table with a sign “Für den Marathon,” had fruit, water, and beer, but it was too close to the finish, so most of it remained untouched. We weaved through town, getting cheers from people tending gardens or walking dogs. The final strech along the esplanade, right on the lakeshore, was crowded with people cheering. Lots of calls of “Bravo!” and “Pop, pop, pop!” accompanied me along. I saw Kristen up ahead and as I passed by, I heard a couple of street performers launch into “Country Roads,” by John Denver. Kristen had heard them perform it earlier and somehow convinced them to play it for me as I ran by. 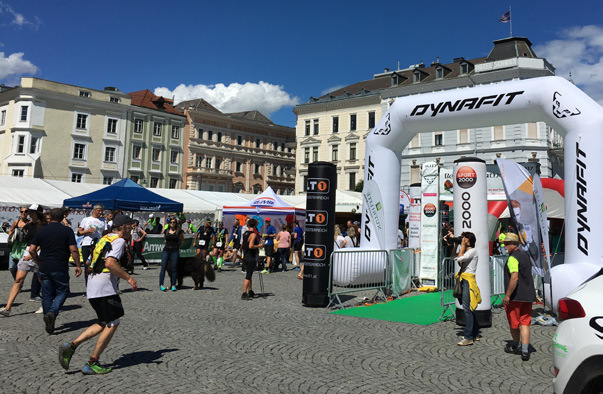 The finish in the Gmunden town square. Photo by Kristen Barthel. We finished where we started, in the town square. The finish line announcer introduced each runner as they came in, telling the crowd who they were, where they were from, and who they ran for. I crossed the line in bright sunshine and under blue skies at a total time of 13:29, 31 minutes faster than my goal time. Coming in! I was trying to smile, but it mostly came off as a grimace. Photo by sportograf.com. Done! 13:29 hours. Photo by Kristen Barthel. This race was great. The setting was beautiful, the scenery amazing, and the organization and execution was flawless. 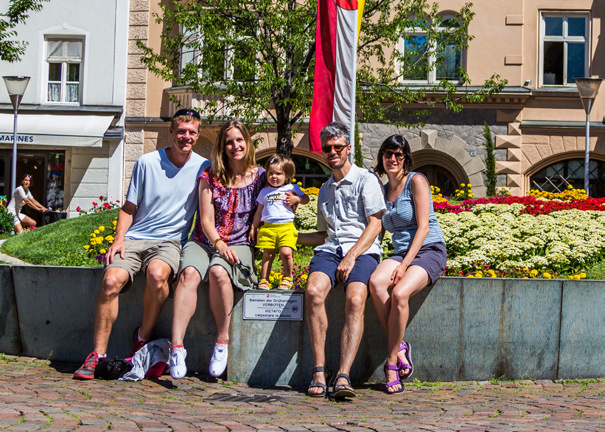 I especially loved the engagement with the surrounding communities of Gmunden, Ebensee, and Altmünster. The people of the community are drawn into the event through community-centered organized events; the day before the race, there were multiple children’s runs of various lengths and during the race, the organizers put on a charity hike. This year’s recipient was a local father of two special-needs children who recently lost his wife to cancer. The community then donates energy back into the race, setting up aid stations for strangers, donating their own cups and mugs in the process, volunteering at “official” aid stations, getting their children involved in volunteering and cheering, and helping the runners fight through the last few flat miles through town. The race director, Harald Buchinger, puts on a fantastic event. There’s some family pride here, too: his father conceptualized and originated the race back in 1989. After my finish and despite a significant language barrier, we managed to communicate with each other about the beautiful course and the fun time I had running it. Hanging out and chatting about the race with Harald Buchinger, the race director. Photo by Kristen Barthel. I know that he has a desire to attract an international field. 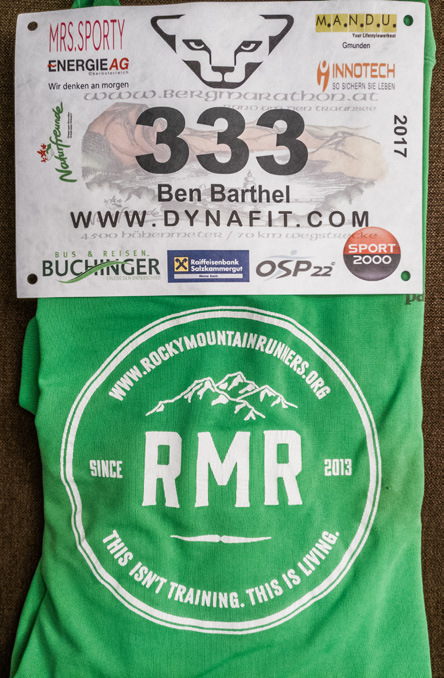 His press releases regularly counted the countries participating and after I registered for the race, Harald started following Rocky Mountain Runners on Facebook. He sent us a message with the link to the race page and he’s added a few of our group as friends. When I told him that I would love to return and do it again, he told me that he’s looking forward to it and that I should bring some friends with me! So, friends, here’s my take: if you are looking for a race in Europe and you’re not yet sure what you want to do, think hard about this one. This race deserves more international recognition. You will love it. 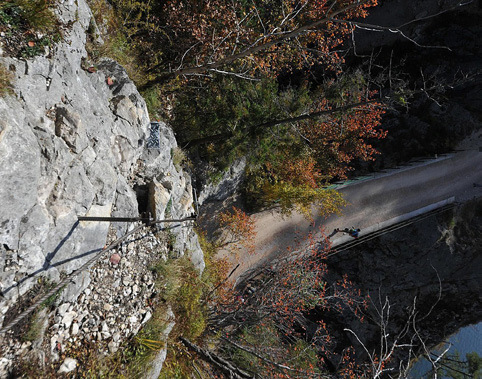 You will love the beautiful, diverse terrain and the spectacularly challenging climbs. You will love the low-key, local feel of the race and the involvement and suppport of the community. If you want to race it, you will love that this race does pull in some very fast local runners and even with all the elevation change and technicality, the course record is still around 7 hours. If you are counting points for UTMB, this race gives you 4 more. 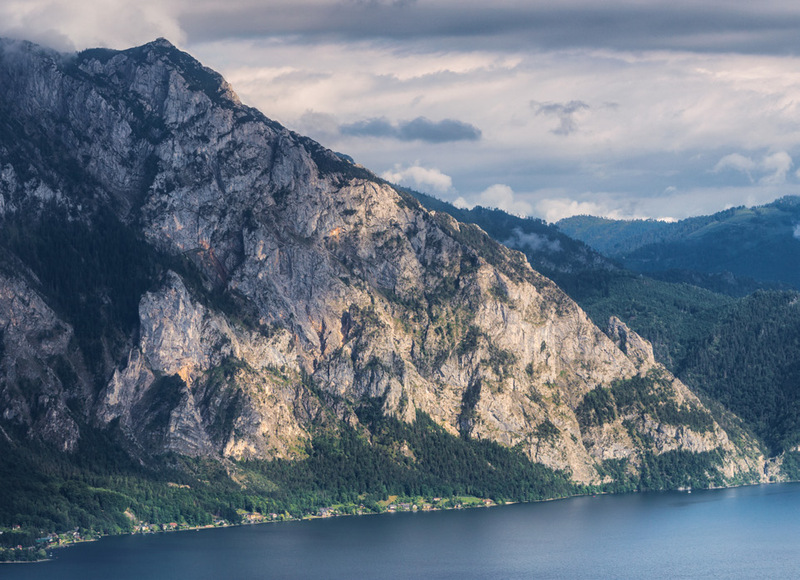 So if you find yourself looking for something to do around the beginning of July next year, think about taking a racing vacation to the Salzkammergut of Austria!